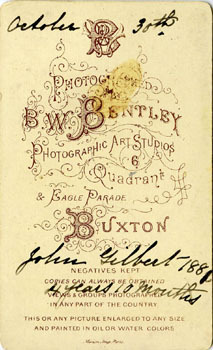 The post card format for photographs was introduced around the turn of the century, and was particularly popular before, during and after the Great War, although it continued in common use until the 1940s. Kevin Rhodes sent me this post card portrait of his relative Frances Rankin (at right) seated with an unidentified friend in a garden. 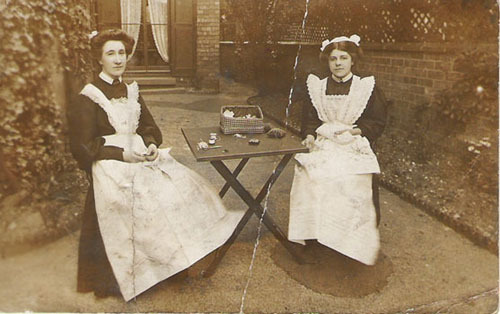 Both are dressed in what appear to be maids' uniforms, and seated next to a table with a sewing basket and other sewing paraphernalia. Kevin asked "Did the photographers go out to private houses and take alfresco pictures like this? And would they bother with the servants? It seems so by the evidence but I am surprised. 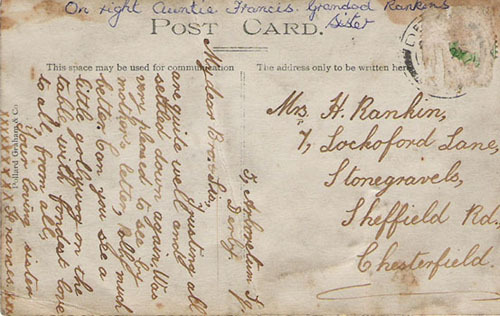 I don’t know if the address on the Postcard fits to the picture." My first task was to estimate a date for the photograph. It is unfortunate that the stamp has been ripped off, and that the postmark is largely obliterated. There is enough of the latter still visible to confirm that it was indeed posted in Derby, and the remnant of the stamp still stuck to the card is, I believe, enough to identify it as one of two King George VI green half-penny definitive stamps issued in 1911 and 1912. They were replaced by another issue later in 1912, suggesting that, if my identification is correct, the card may have been posted in 1911-1912 or shortly after. The clothes worn by Frances and her companion appear to be appropriate for that approximate period. 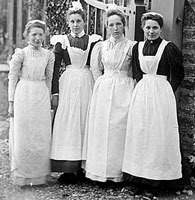 It's perhaps worth illustrating the development of domestic uniforms over the decades, from the 1880s until the 1940s, with the following selection of images from my own collection and from others on the web. Hover your mouse over an image for the approximate date, click on it to see the original source. 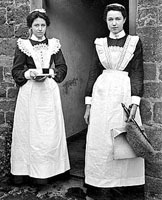 I found an interesting discussion of the lives of Victorian domestic servants on Peter Ward's web pages. 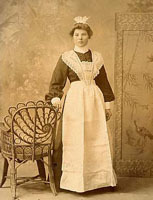 Housemaids appear to have had slightly different uniforms from other house servants, such as the housekeeper, ladies' maids, cooks, kitchen maids and scullery maids. 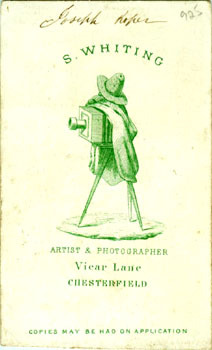 The reverse of the post card shows that it was produced by the studio of Pollard Graham, who operated a studio in Derby for several decades from the mid-1880s until the 1930s. I checked the 1912 issue of Kelly's Trade Directory for Derbyshire, probably compiled in late 1911, and discovered that the occupant of 5 Arboretum Square, Derby - the home address given by Frances - was none other than the photographer Pollard Graham himself! I think this deals directly with your question about whether photographers would normally have gone to private residences to take portraits of servants. The answer is, it probably depended on the circumstances. 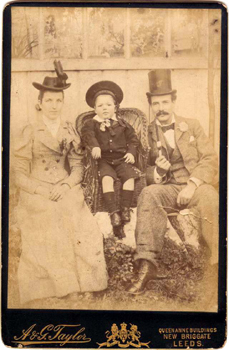 I have a photograph of my great-grandparents and my grandfather (shown above), taken in about 1894 by a Derby studio photographer (in spite of the card mount stating Leeds! ), almost certainly in their garden in St James' Street, Normanton. However, they could perhaps afford it. The Arboretum Square photo may well have been done for free by Pollard Graham for his employees. A nice gesture. We'll have to wait a few years until the 1911 Census is released, but when it is, we may well find this confirms that Frances and her friend were working for Pollard Graham. Perhaps we may also be able to identify her companion. Buxton is situated in north-west Derbyshire, on the edge of the Peak District. In the mid- to late 18oos, due to it's location and the presence of mineral springs, it developed as a fashionable resort. The photographer B.W. 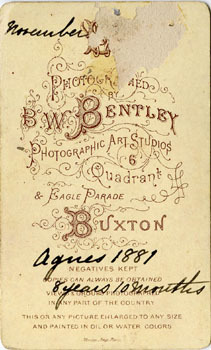 Bentley (1829-1886), although originally from Stockport, took advantage of the burgeoning tourist trade, settling in Buxton in the early 1850s. He, and after his death, his widow, continued to operate a studio at "The Quadrant" for almost four decades. 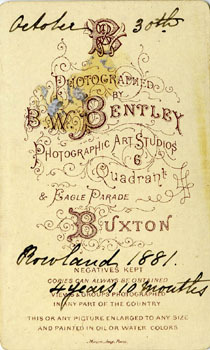 The implication is that the children depicted on these photographs, Agnes, John Gilbert and Rowland, could easily have been from elsewhere, and only in Buxton with their parents briefly on holiday, when they took the opportunity to visit the studio in late October/early November 1881. However, it does help that we have the exact date - 30 October - of the sitting, at least for the latter two. Using a combination of the 1881 Census and the index of birth registration data on FreeBMD, I was able to identify them with a good degree of certainty. They were three of at least nine children of a Lancashire surgeon Rowland Heathcote senior (1841-1915) and his wife Elizabeth. At the time of the 1881 Census, they were living at 5 Stockport Road, Ardwick, near Manchester, Lancashire. and his wife, Elizabeth. Rowland and John Gilbert were twins, which perhaps explains why they are dressed identically, although it was not uncommon for siblings to be attired in this manner in the latter part of the nineteenth century. According to information in the Manchester Medical Collection Biographical Files, presented online by Cheshire for Archives, the Heathcotes were a medical family. Rowland senior was a son of Ralph Heathcote (1795-1863), the founder of the dynasty. Ralph was a surgeon who lived at Waltham-on-the-Wolds near Melton Mowbray in Leicestershire. He and his wife Elizabeth Hickling had eight children, including four sons who followed him into the medical profession. Robert Hickling Heathcote (1823-1864) was the eldest; he studied at the Manchester Royal School of Medicine and became a general practitioner in Grosvenor Street, Manchester. Ralph Heathcote (1825-1911) was also a student in Manchester, and set up a general practice at Piccadily in that town. The third son to attend the Manchester school was Godfrey Heathcote (1830-), who qualified in 1855 and had a general practice in Great Ancoats Street, Manchester. Several of Rowland's children also studied medicine and became doctors. Rowland Heathcote junior (1876-1943) graduated from Owens College in 1905 and was in general practice in Disley, Cheshire. His twin brother John Gilbert Heathcote (1876-1950) qualified in 1905, having also studied at Owens College, and was an assistant school medical officer for Sheffield Council. Godfrey Heathcote (b. 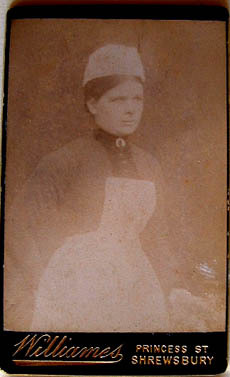 1878) was a graduate of the University of Manchester and was an assistant school medical officer for Salford Corporation. 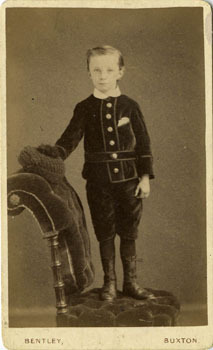 The youngest son, Harold Heathcote (b. 1888) was a graduate of the University of Manchester, a school medical officer for Salford Corporation and a member of Manchester Medical Society. 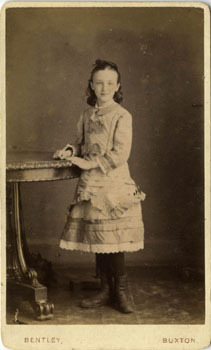 Rowland and Elizabeth's eldest daughter Agnes Heathcote (b. 1872) is shown as a medical student in the 1891 Census, but in 1893 she married John Bennett Lancelot (b. 1864), Church of England minister and Principal of Liverpool College; by the time of the 1901 Census was shown with no occupation. 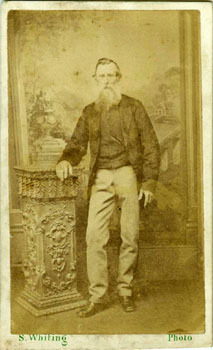 Joseph Roper was born at Brampton, near Chesterfield, Derbyshire in 1791, son of Joseph Roper senior and his wife Sarah. In 1814, he married Anne Heath at St Peter's Church, Old Brampton, and when a son George was baptised there on 1 March 1815, Joseph described himself as a plasterer, living at Ashgate (a hamlet near Brampton). Anne presumably died shortly afterwards because Joseph was remarried at Chesterfield on 4 January 1820 to Anne Heald (1796-); again he described himself as plasterer. Joseph & Anne went on to have another three daughters (Anne, Emma, Elizabeth) and three sons (Wlliam, Charles, Henry/Harry) between then and 1839. The family are shown living at White Horse Yard, West Bars, Chesterfield in the 1841, 1851 and 1861 censuses, and Joseph continued working as a plasterer. He died at the age of 77 at Chesterfield (Regn. Dist.) in the June quarter of 1868. More detailed biographical and professional notes for photographer Samuel Whiting have been provided elsewhere, but he operated a studio in Chesterfield from at least 1868 until the 1880s. 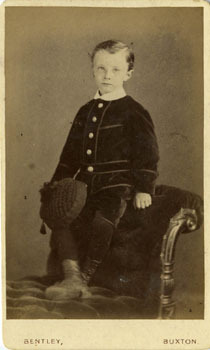 The earliest premises recorded were in Vicar Lane, and it seems likely that Whiting took this portrait of Joseph Roper shortly before the latter's death, possibly between 1866 and 1868. I purchased this carte de visite on eBay, my interest having been aroused by the fact that it was the only example I had then seen by the itinerant photographer and travelling fairground showman Samuel Whiting, and because the subject was identified on the reverse. However, I subsequently discovered that fellow DerbysGen lister Liz Newbery is descended from Joseph Roper's sister Anne Roper (1796-1872), who married Richard Kirk (1795-1867), Chesterfield's crier. I'm grateful to Liz for sharing her research material, and know that she's enjoying the detailed image of this photo that I sent her. I'd be happy to do the same for any other family members who'd like to get in touch. Welcome to Photo-Sleuth, devoted to investigating the stories behind old photographs. I've set this up as a sister site to my Derbyshire Photographers & Photographic Studios. What I hope to include here is a series of images of old photographs, mainly portraits - both from contributors and from my own collection - that have interested me, and I hope will interest you too. They won't necessarily from Derbyshire or even England, but many will inevitably be. I would like to invite readers to participate - contributions of interesting images and your thoughts on any photos already on the site are most welcome. Most of the images will be accompanied by the results of my own research into either the photographer or the subject - if you have any questions or something to add, please don't hesitate to get in touch, either by posting a comment or emailing me. Victorian portrait cartes de visite and cabinet photos with the subject(s) identified and dated on the reverse, the earlier the better. Any other oddities with a family or local history bias, from anywhere in the world. ... but the list may change from time to time, and if you have something that doesn't fit into any of these categories, don't let that deter you from getting in touch. Most of the photos will have a family history or genealogical bias, as that is where I'm coming from, my interest originally having been stimulated by research into my own family. My postings may be irregular, but the best way to stimulate me into posting more photos is to provide some feedback. It's always nice to hear from like-minded folk.